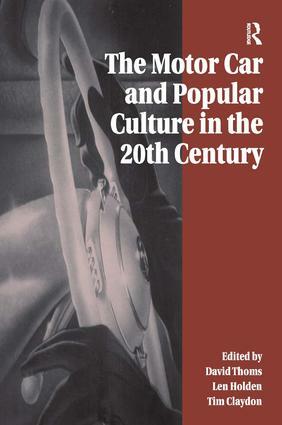 This is a multidisciplinary analysis of the relationship between the motor car and popular culture in the 20th century, which brings together original essays by academics in the UK, North America and Australia. The contributors write from a wide range of disciplinary perspectives, including semiotics, social history, literary and film criticism, and musicology. Three main themes are addressed: the car as a cultural image; its impact on leisure and entertainment; and the cultural significance of the processes of manufacturing and selling cars. Contents: Introduction, David Thoms, Len Holden, Tim Claydon; Part One: The car as image: ’Oh what a feeling!’ - the literatures of the car, Nicholas Zurbrugg; More than a marque: The car as symbol: aspects of culture and ideology, Len Holden; Motor car ownership in 20th-century Britain: a matter of convenience or a marque of status, David Thoms; ’Savage servility: cars in the psyche, Sebastian Lockwood; Mad Max and Aboriginal automation: putting cars to use in contemporary Australian road films and narratives, Ken Gelder; Part Two: Entertainment and Leisure: ’Poop, poop!’ - an early case of joy-riding by an upper class amphibian, Kathleen Bell; Automania: animated automobiles 1950-68, Paul Wells; Cars and girls - the car, masculinity and pop music, Duncan Heining; Spectacles of speed and endurance: the formative years of motor racing in Europe, Daryl Adair; Classic and desirable: the mystique of the British sports car, Steven Morewood; ’Four wheels good; two wheels bad: the motor cycle versus the light motor car 1919-59, Steve Koerner; Taste, status and middle class motoring in interwar Britain, Sean O’Connell; Part Three: Producing and Selling Cars: Shop floor culture in the Coventry motor industry, c.1896-1920, Brad Beaven; Cars, culture and war, Tom Donnelly; Images of disorder: car workers’ militancy and the representation of industrial relations in Britain, 1950-79, Tim Claydon; Imagination and passivity in leisure: Coventry car workers and their families from the 1920s to the 1990s, Paul Thompson; ’Mini loves dressing up’: selling cars to women, Jenny Rice and Carol Saunders; Transports of difference and delight: advertising and the motor car in 20th-century Britain, Tim O’Sullivan.